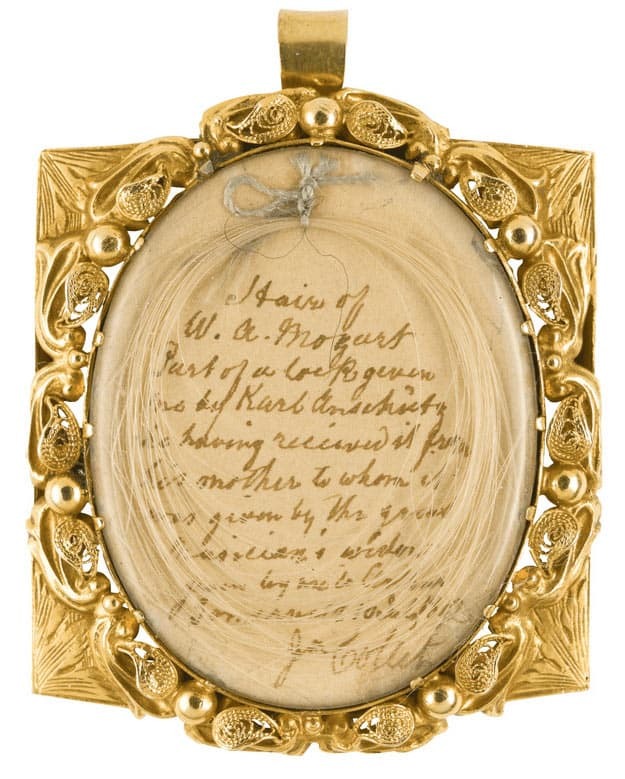 On Thursday 28th May a lock of hair belonging to the master composer Mozart went up for auction at Sotheby’s. Encased in a gilt locket, Sotheby’s valued the piece of hair dating back to 1791 at between £10,000 and £12,000. The lock of hair was originally owned my Mozart’s widow, Constanze. Locks of hair were often taken from the composers as keepsakes after they died. When Beethoven’s friend, Gerhard von Breuning, came to pay his last respects in 1827, he found that previous visitors had already snipped off all his white hair. It was then given to Karl Anschütz’s mother who passed it to him when she died. Karl came to England in 1949 where he led the orchestra at Drury Lane and met Arthur Somervell, one of the most successful English song-composers. It’s thought Arthur was gifted Mozart’s hair on his wedding day and Somervell’s wife proceeded to wear it in a gold locket on a bracelet. The present owner is a direct descendant of Somervell. In 2002, a lock of Mozart’s hair was sold at auction for £38,240 which was double the pre-sale estimate. This one fetched a little less, selling for £35,000 but again it was sold for over double what it was expected to sell for.